Sound Louvers manufacturer supplier in Dubai UAE, Sand Trap Louvers Dubai UAE. 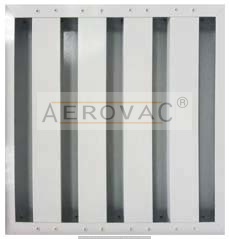 Prime Sand Louver standard construction comes with complete aluminum extruded profiles unit. It is composed of two sets of inverted U channels mounted vertically on two opposite's rows. It is corrosion resistant and suitable for different weather conditions. Prime Sand Louver is fitted with bird wire mesh made of galvanized as standard construction. (Aluminium and Stainless Steel are optional). Installation of Aluminium Washable Filters on the neck of the sand louvers (Optional). Prime Sand Louver is a self-emptying system, it has a set of holes of 20 mm at the bottom face of the casing to discharge separated sand particles.